There's plenty more to come from the Tuesdays Post sessions that have already produced The Rest Is Noise - our plan for 2016 is to make tracks available on SoundCloud as soon as they're ready, for comments and feedback, before they're collected for Bandcamp and final download release. The first track in the next series - Giving Up The Ghosts - was originally recorded in January 2015, with Peter Chilvers (collaborator with Brian Eno, Karl Hyde and Tim Bowness) guesting on piano. Peter played bass on the first two Darkroom albums, and we're delighted to feature his distinctive piano playing. We're also happy to be continuing our collaboration with photographer Israel Denadai on the cover images for these tracks. Before our headline set at the Y2K15 loop festival in Santa Cruz back in October 2015, we met up with music journalist Anil Prasad to record the first audio interview for Innerviews, the Web’s first and longest-running music magazine. 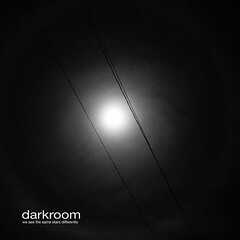 We talk about Darkroom past, present and future: listen here.